The support you want and the system design you need. We are always passionate about providing you with the innovative solutions you need, no matter your budget, space, or demands. In this way, we are happy to offer a wide variety of storage systems that fit your needs perfectly. The optimal choice for using your space efficiently, an effective Automated Storage and Retrieval System is ideal for warehouses with a high volume of inventory because it cuts the time and costs associated with manual labor while greatly increasing your storage density. 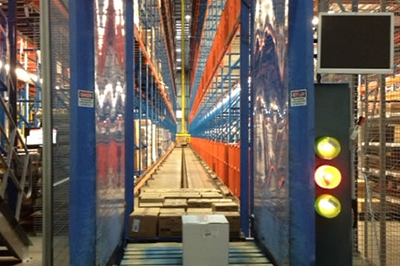 Using automated cranes to move pallets and cases through unit load or mini-load storage systems, an AS/RS System provides more control over your inventory tracking while allowing more flexibility for a growing and changing business. While these systems are widely recommended for businesses who suffer from critical levels of inventory, high land costs, and the ability to build up not out, our passion for serving you means that we will analyze every aspect of your warehouse to determine if this system design is right for you. Because our quality service doesn’t stop there, we will also fully integrate the installation for the unit load, mini-load and software that drives the crane, so you can have a complete system that you can truly rely on. Our project management and engineering teams are made up of some of the top technicians in their fields, and in this way, we stand behind the work we do, ensuring that you have a racking system that makes your AS/RS systems work to their highest efficiency. Every time. Call us today with any questions, or contact us now to get a free consultation and get the innovative solutions your warehouse or distribution center needs.